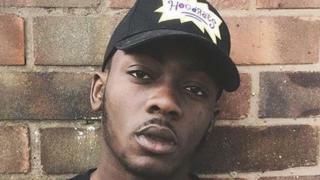 A man arrested in connection with the death of Specials singer Neville Staple's grandson has appeared in court. Fidel Glasgow died in hospital after being stabbed outside Club M in Croft Road, Coventry, on Saturday morning. Atikou Diallo, 23, who is accused of wounding a 23-year-old man, was remanded by magistrates to appear at Birmingham Crown Court on 2 October. The venue's licence will be reviewed by magistrates in Coventry on Wednesday. Tributes to 21-year-old Mr Glasgow, the son of Mr Staple's daughter Melanie, have been left at the scene. Mr Diallo, of no fixed address, was not asked to enter pleas to other charges of causing grievous bodily harm, violent disorder and possession of a controlled drug, during a brief court appearance on Tuesday. Detectives are continuing to appeal for information and have urged anyone who was at the nightclub to contact them. Det Insp Harry Harrison said: "Although an individual has been charged in connection with what happened on Saturday, we're working round the clock to identify and apprehend Fidel's killer. "I am appealing for anyone with information no matter how insignificant it may seem to contact us." West Midlands Police served a 24-hour closure notice on the club after the stabbing, and the force said it has since applied for an expedited license hearing.